New from Buffalo, the Horizon is a feature-packed, four-season textile jacket that is adaptable to a variety of weather conditions. 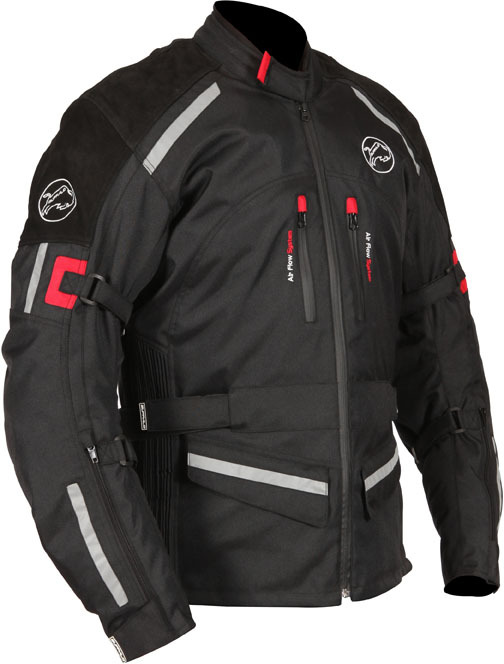 The tough 600-denier outer shell is reinforced with leather panels over the shoulders and CE-approved armour is fitted at the shoulders and elbows. Inside is a windproof, waterproof and breathable drop liner, which can be removed in warm & dry conditions to allow greater air flow. A removable thermal quilted liner helps to insulate on colder days, and an adjustable waist belt and Velcro® straps on the arms allow the wearer to achieve a draught-free fit. There is also a trouser-connection zip, to prevent the Horizon ‘riding up’ and allowing cold air in. When the temperature rises, vents at the chest and back allow cool air in and let hot air escape. These can be used independently, or together, to give the best combination for the conditions and handy 2-way zips on the cuffs can be opened for additional ventilation. Stretch panels on the arms and sides of the jacket aid flexibility and freedom of movement., keeping riders comfortable, even on long days in the saddle. Topping off the extensive specification are zipped pockets, both inside and out, as well as a handy large rear map pocket – plenty of places to store all those travel essentials that need to be kept close to hand. The Buffalo Horizon comes in sizes S – 5XL, in black with red and white highlights.